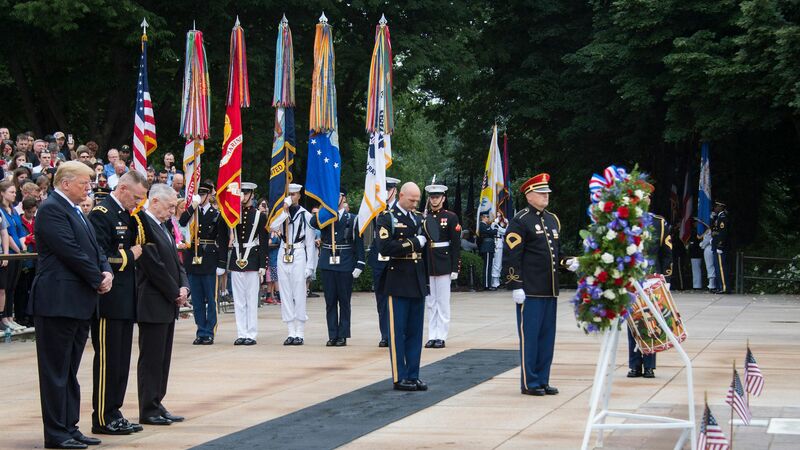 Memorial Day is to remember those who've fallen while serving in the U.S. military, and President Trump noted those losses in remarks today at Arlington Cemetery. Senator Bob Dole, a WWII veteran. Ray Chavez, the oldest surviving veteran from Pearl Harbor. The family of Marine Lieutenant Colonel David Greene, including his wife Sarah and children Jena and Wesley. Greene was killed in Iraq in 2004. The family of Army Captain Mark Stubenhofer, including his wife Patty and their children, Lauren, Justin, and Hope. Stubenhofer was killed in Iraq in 2004. The family of Marine Sergeant Christopher Jacobs, including his wife Brittany and son Christian. Back in 2015, Christian laid at his father's graveside in Arlington, saying, “I hope for you to come back soon, Daddy. And I love you and hope for you to be here." The big picture: More than a million service members have died in American history, including nearly 7,000 in the years that have followed 9/11. We mapped the home counties of the post-9/11 fallen in Axios AM, and I'd like to re-up it for those who missed. It's a powerful reminder of how the ultimate price is paid nationwide. Israel's national security adviser will arrive in Washington tomorrow for talks with John Bolton, sources briefed on the trip told Axios contributor Barak Ravid. Details. China is conducting an average of five simulated nuclear tests per month as it develops a more advanced arsenal, the South China Morning Post reports — that’s about five times as many tests as the U.S. typically conducts. Go deeper. The European Commission wants to ban the use of single-use plastic products such as cutlery, plates and straws. More. The latest Star Wars movie, “Solo," is estimated to gross $101 million over Memorial Day Weekend — a record low for Star Wars movies. By the numbers. NewsDigest, a Japanese news app staffed by engineers instead of reporters, is bursting onto the scene, Bloomberg's Shoko Oda reports. They're using machine learning "for finding breaking news in social media posts and writing it up as news reports. Essentially, it’s a newsroom staffed by engineers." Dive in. "[R]unners will follow a more southerly, flatter route in the park, bringing them closer to Midtown Manhattan, closer to the skyscrapers and horse-drawn carriages, Columbus Circle and Carnegie Hall." "The hope is that the more scenic route will draw more participants to the event, one of the largest triathlons in the country, and maybe help them forget that, not long earlier, they had been swimming in the Hudson River." "It is the first time since the race began in 2001 that the run course has been modified." "[P]articipation has hit a wall in recent years, and Hutmacher said the organizers wondered if there was a growing sense of race fatigue."